Mailchimp provides email marketing automation for e-commerce businesses. With Segment you can add people to your MailChimp list with a single identify call. This document was last updated on May 08, 2018. If you notice any gaps, out-dated information or simply want to leave some feedback to help us improve our documentation, please let us know! The first step is to make sure MailChimp supports the source type and connection mode you’ve chosen to implement. You can learn more about what dictates the connection modes we support here. From your Segment UI’s Destinations page click on “Add Destination”. Search for “MailChimp” within the Destinations Catalog and confirm the Source you’d like to connect to. Drop in your MailChimp “API key” into the connection settings. It is recommended that you create a brand new API key for the Segment destination. MailChimp restricts each API key to a maximum of 10 concurrent requests, so creating a dedicated one for Segment will ensure maximum throughput for outgoing calls. You can read more about API keys on MailChimp’s docs. Drop in your MailChimp “Audience ID” into your connection settings. First ask Mailchimp if that email exists and what their subscriber status is for the listId you have provided in the destination settings. If they do not exist, we will subscribe that user to the list immediately. If you have doubleOptIn setting enabled, it will send a confirmation email to that user before subscribing them and that email will not be tagged with a subscriber status of pending. If they already have a subscriber status such as pending, subscribed, unsubscribed or cleaned, we will NOT resubscribe them but simply update their user traits. So you no longer have to worry about the identify call resubscribing users unintentionally! Segment recognizes firstName, lastName and email as special traits, so we will translate those for you to match the Mailchimp accepted field names. Mailchimp includes these fields by default when you create a list. If you want to view any other custom user traits in the Mailchimp list dashboard, you must create a Custom Merge Field inside Mailchimp’s UI of the traits in your identify calls. Note that you do not need to map all user.traits you are sending inside Mailchimp. You only need to create Custom Merge Fields of the traits you want to see in your list view. IMPORTANT: Mailchimp only supports merge tags that are 10 characters or shorter. So for every user trait you send inside the .identify() call, we will trim it to be the first 10 characters and will send it in uppercase form to Mailchimp. So it’s very important that when you set up your merge tags in Mailchimp, your Merge Tags are the first 10 characters (excluding whitespace or special characters) of its Field Label (if it’s over 10 characters). For example, if your Field Label was Way Too-Long123, your Merge Tag should be WAYTOOLONG. And the user.trait inside your .identify() call would be Way Too-Long123 since we will convert that to WAYTOOLONG before sending it to Mailchimp. If you are going to be sending either a boolean or null object as a user.trait value, when creating the custom merge field for that trait inside Mailchimp, make sure to set the data type as TEXT since we will stringify all boolean or null objects to strings. Also note that fields you specify in Mailchimp as date fields must receive dates. Passing non-date values will cause issues. 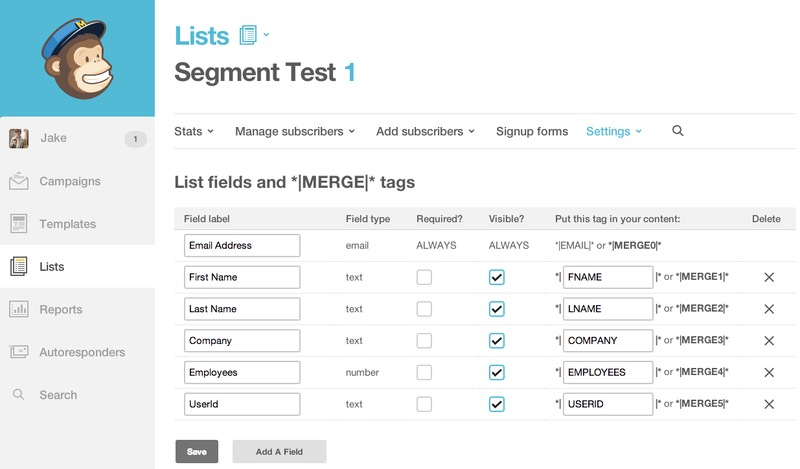 To send custom merge fields/user traits to Mailchimp you need to create the merge field first in Mailchimp for each trait you want sent to Mailchimp. Then when you call identify with keys that match those traits they will appear in your Mailchimp list. For any other custom traits just add a Mailchimp Custom Merge Field inside of Mailchimp with a tag that matches the key you are using in your identify call. In the example these traits are company and employees. They will be shown as COMPANY and EMPLOYEES in Mailchimp, but you can record them in lower-case to identify and they will still be populated. One thing to note is that you shouldn’t use underscores in your custom Merge Field names. If you send a userId in your .identify() call, we will attach it as Mailchimp’s semantic unique_email_id for that user. This is a read-only unique identifier for that email across all of Mailchimp. Important: You must use the semantic property exactly as is, subscriptionStatus (case-sensitive) and the value of this property must be one of the four valid statuses supported by Mailchimp: pending, subscribed, unsubscribed, and cleaned (all lowercase). Again, this will NOT work for new users. New users will always have their subscription status set as either pending or subscribed depending on your double opt-in setting. Why are my calls with trait arrays not showing up in MailChimp? MailChimp does not support arrays as traits values. This can cause calls to not show up.